Coinciding with the neighboring Old Town Art Fair every June, MBT’s Used Book Sale attracts hundreds of passersby and serious book-lovers with tables filled with books, CDs, records, and this year we have vintage baseball cards for sale! Some items sell for as little as $1. Refreshments will also be sold. 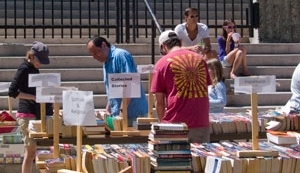 In addition to being a great stop for shoppers, the Used Book Sale offers a perfect opportunity to volunteer at MBT, meet interesting people and become a part of some fun on a summer afternoon at the temple. Proceeds from the event benefit the temple’s outreach programs.